It's not that I didn't like this collection, as I am lust over several pieces. But I wasn't sure what this show wanted to be. Equestrian meets Teddy Boy in the Highlands? Then along comes urban modern goth? There was also lots of this. Loads of this. 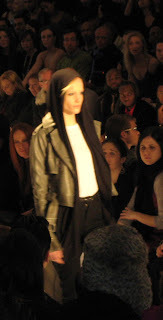 I wouldn't kick this drawstring leather trench out of bed, though, that's for sure. Nor the pompom hat. Although I admit that by the end of the show, I was tiring of the big pompom. Indicative of a lot of repetitive looks in this show. However, look for Monarchy in boutiques here. Because really it's a bit of a dream to look Teddy Boy, Scottish Highlander and equestrian all at once. And Eric Kim, Monarchy's designer, is one to watch for a harder-edged, American-based aesthetic. I definitely need a new leather jacket...or a cool vintage one! Isn't it cool to be a little bit country and a little bit rock and roll at the same time? I think that if I had seen a show with looks all reflecting one theme, it would have been boring. Monarchy mixed it up while still maintaining a merchandised show. And the men were stunning! I love your category mash-ups! thanks, Farren, i finally got him to shave his beard, couldn't take it any longer. 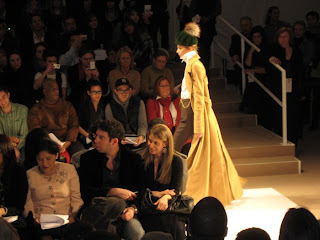 bowerbird - that leather coat is fantastic, one of my favorite pieces in the show. anon - oh, the men were stunning, well said! Ooooh at the men's hats and the ladies hoodies!